Iams needs your help ASAP to choose the pet stories that inspire you the most. Watch the five videos on the Iams Facebook page (two featuring cats and three featuring dogs) and vote for your favorite. All of them are inspired by real stories and are meant to capture the important role quality food like Iams can play in keeping your pet healthy and strong as the love you share. Voting only runs through tonight- November 29th, so do it now! How does your pet express their unconditional love? Comment below for the chance to win a doggy gift basket similar to the one shown, complimentary of Iams. US entries only. One winner will be selected at random on 12/6. 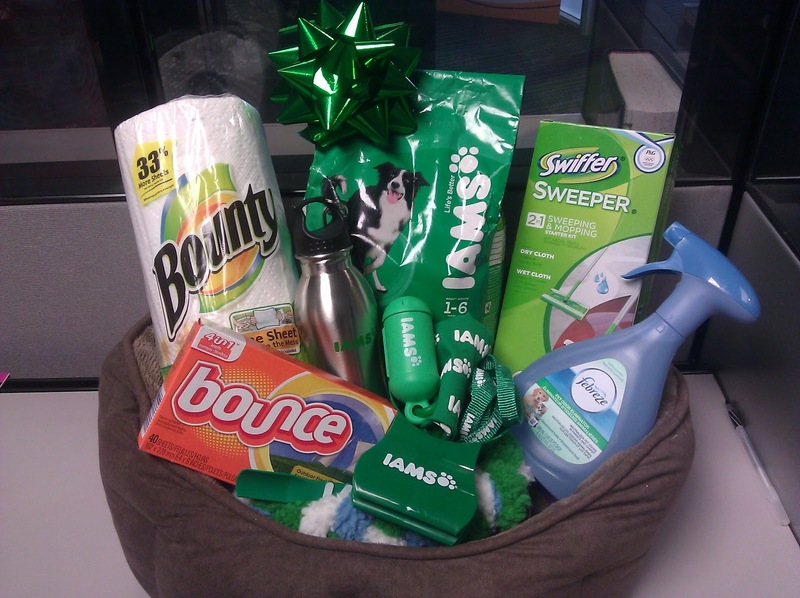 In accordance to the FTC Guidelines and the WOMMA Code of Ethics, I am disclosing that this giveaway is being sponsored by Iams. No compensation was provided. All opinions are, as usual, entirely my own. she was on medication and quite ill! we arrive home, it is like we have been gone forever. She is very smart and can perform many doggy tricks. Even after her curiosity gets her in trouble, she still loves us. Our dog loves to cuddle up to anyone sitting on the couch. At night, he sleeps in a chair right outside the bedrooms. Never judging, always so gentle and caring. No matter how bad the day has been our dog is always there to great us with a wagging tail... So happy he is part of our life, brings us joy only a great dog could bring! By cuddling and wagging their butts like crazy (and I mean wagging their butts, because their tails are going so crazy their whole back end is wagging)!! By rubbing against our legs - especially when we're trying to walk thru the yard! Our dog always looks happy to see us, wagging her tail & also gives her paw & does all her tricks when we ask her to. Since I am all about the cat, my Roxy shows her unconditional love by purring anytime I touch her and snuggling on the couch(as long as I have a blanket for her to bury under). She actually comes if I call her name and just generally will listen to whenever I need to let it out, of course shes rubbing in face at the time). Now I also have 2 dogs, who love my hubby and daughter so much. They show their love by being there any time of day or night, just to play, lay with or listen.